Learning about adaptive climbing at Adaptapalooza. Recreation is a path for everyone. 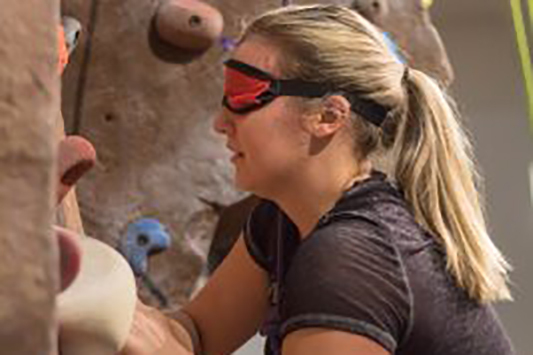 Members of the Illinois State University community can experience how recreation can be adapted for those with disabilities at the annual Adaptapalooza from 5 to 6:30 p.m. Wednesday, February 27, in the Student Fitness Center. Now in its fifth year, Adaptapalooza was created by therapeutic recreation students at Illinois State, all working to give people the tools to experience the benefits of activities, sports, and recreation without limits. The event is free and open to the Illinois State University community. Registration is not required, and participants can drop in as schedules allow. An Illinois State identification card is needed to access the Student Fitness Center. Activities will include wheelchair basketball, sitting volleyball, goalball, and adaptive rock climbing. This year’s event will also include a member of the U.S. Paralympic Team, Ashley Green, who will answer questions and lead participants in sitting volleyball. Adaptapalooza occurs during Therapeutic Recreation Month to educate the Illinois State University community about therapeutic recreation. For more information, talk to any therapeutic recreation student or contact Hildebrand at sahilde@ilstu.edu.